State Rep. James Grant, R-Tampa, is an attorney who was first elected to the state House in 2010, was easily re-elected in 2012 and 2014 and then ran unopposed in 2016. Jessica Harrington is a Hillsborough County middle school social studies teacher making her first run at office. She founded the ocean advocacy group Straw Free Florida and works with children in South America through the University of Florida’s nonprofit branch of Children Beyond Our Borders. Andy Warrener is a carpenter and free-lance journalist running for office for the first time. His articles have been published in the Tampa Bay Times and Creative Loafing. He also helped write the 2018 movie “The Black String” starring Frankie Muniz. 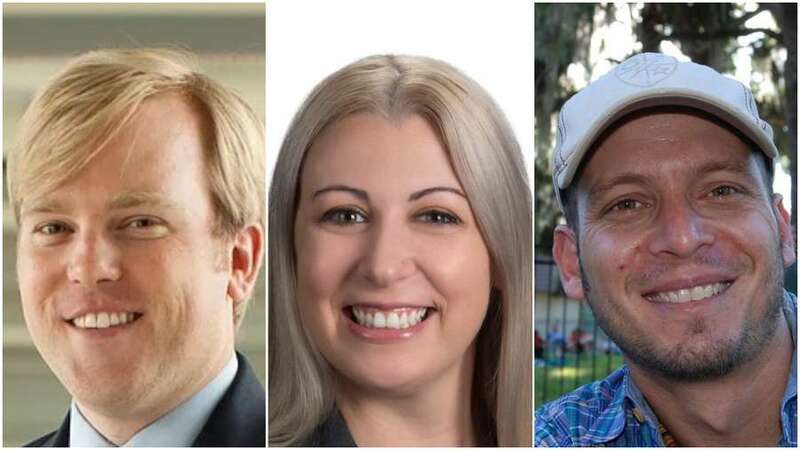 Florida House District 64 starts with Safety Harbor and Oldsmar in Pinellas County then extends east into Hillsborough County, covering Keyston, Lutz, Greater Northdale and Westchase. State representatives serve two-year terms and earn $29,697 a year. Grant wants to cut taxes and “burdensome” regulations; defend the Second Amendment; supports a “zero tolerance” policy of sexual harassment against legislators; occupational license reform; and investing in workforce development. Harrington supports Medicaid expansion and Medicare for All; wants to increase school funding; pass a bill to hold lawmakers accountable for sexual misconduct; and protect the environment. Warrener wants to increase per-pupil spending on education; restore funding for land preservation; supports Medicaid expansion and wants state investment in doctor-patient co-ops; and an independent agency to start investigating claims of sexual misconduct against lawmakers. Follow @TimothyJFanning ‏ for Election Day news on the SD 18 race.